Kata Mobile, A Hong Kong based electronic device designer and researcher, teams up to mobile marketer in the Philippines to sell Kata brand smartphones and tablets. First post of mobile31, the Kata FishTab 3. The 3rd version of FishTab series, recently been announced on KATA Facebook page, that FishTab 3 will soon be available in the Philippines. Operated by Android 4.2.2 Jelly Bean software, FishTab 3 is set to be compatible on most apps and games in PlayStore. Plus a powereful 1.8GHz quad-core Rockchip RK3188 processor, combined with 2GB of RAM, almost enough specs to par with Google Nexus 7 2nd Gen (2013). While Quad core processor are common this days, Kata FishTab 3 will offer an outstanding GPU 533MHz Mali-400MP Quad core. 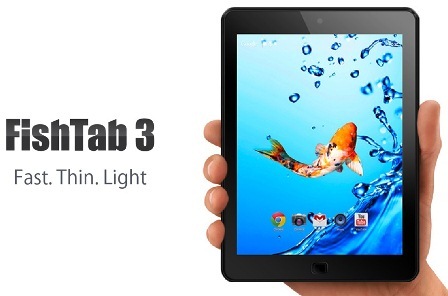 The FishTab 3 will be light, fast, and entertaining. Finally, to appreciate what the processing power can do, FishTab 3 will support HD viewing on 7.9 inch IPS display. Read more for full specs, price, and availability. For Php10,999 SRP (Almost 11k :P) | Available this 3rd week of August 2013 nationwide. Just to add up, an Online Marketing Officer emailed mobile31 with the following message. This is Raisa Montoya, Online Marketing Officer of KATA Mobile, a mobile company based here in the Philippines and Hong Kong. I would like to invite you for a meeting this coming Aug. 12, 2013 (Monday) or Aug. 13, 2013 (Tuesday) afternoon to discuss about our upcoming unboxing event of our newest KATA FishTab 3 that is soon to be released in the market. Unfortunately, we couldn't come on the event. Anyway, what can you say about KATA FishTab 3? Kindly share your thoughts about this! Everyone’s invited to the unboxing event of Kata FishTab 3 in SM City Manila Event Center at 4pm on August 18, 2013. Get the chance to own the latest Kata FishTab 3 and avail its 20% promo discount at different Kata kiosks and Owtel shops at a limited time (5pm-9pm). Huh? I was at owtel metro east this pm and the staff didn't even tell me of that 20% disc. I guess they dont value their loyal patrons, tsk, tsk, tsk! very nice specs! will try it.. I bought fish tab 3 and having problems when playing music on headset or the dock speaker when volume it above 75% the music suddenly stops or pauses .. What could be the problem? Is it the audio jack? I don't think the audio jack causes this problem. Must be the music file your playing, otherwise It would be better to let KATA technicians check it. I was cheated by the owtel agent they said just only 82.88 but when I got my email it cost 250 I'm so upset and want to return it them .anyway I have an apple iPad I got for a gift supposedly because they said they have a promotion ..